Dallying In The Dirt, Issue #300 - The cursed weeds defy the best laid mulch. OK! Now I’m really annoyed. I’m undertaking the great downsizing partly because I can’t keep up with all of the weeds. Use mulch they say. I did! Two weeks ago I pulled out my Raspberry patch because it was growing lots of weeds and was getting too shady to produce many berries. I even rototilled the space. I planted a few nice shrubs. The new Lavalamp Hydrangea paniculatas from Bloomin’ Easy in the back row and their Tuxedo Weigelias in the front row. 6 - 7 cm (almost 3") of the best cedar mulch in between them; that’s $16 and a couple of hours work. I figured my worries about that part of the garden were greatly reduced. Wrong!!! 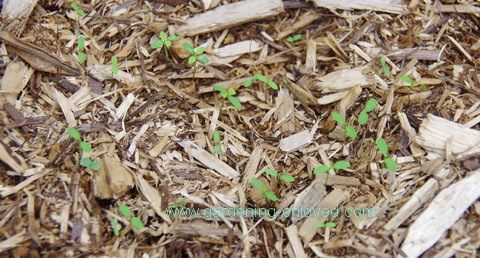 In three weeks all of these seedling weeds emerged right up through the mulch. Now I have to weed the mulch. 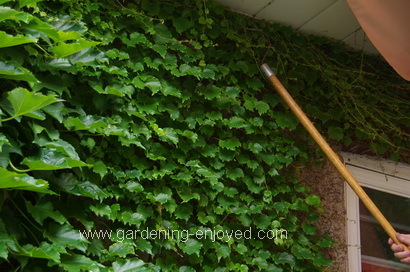 I am not a happy gardener. It might have been interesting to put 15 cm of mulch on the bed and cover half of the shrubs and see if the weeds still managed to make it through. Maybe I should pave it all with interlocking brick and then watch the weeds grow in the cracks between the bricks. I saw several varieties of artificial turf at the last trade show I went to. I meet the Cobra Head people every year at our Garden Writer’s meeting and trade show. That is also where we get to see the newest plants and the newest trends in plants. Succulents, both indoors and out are the latest and greatest things to be planting. 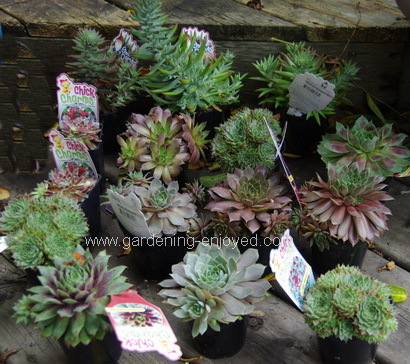 These Sempervivums, (Hens & Chicks) are the result of some fancy plant breeding and selecting from the several hundred species of these tough succulents. This work has created the latest plant collectibles from a rather staid old standard of the rock Garden. Marketed in the USA as Chick Charms these vary hardy and tough plants can now be found in several colours and shapes. This is the group that I brought home from that trade show and they will soon be gracing the new scree garden at the front of the yard and some of the rockery around the waterfall. I know, I’m supposed to be downsizing but these cute little fellows take care of themselves and the scree garden does not support many weeds. Gardening, it’s an addiction. The great plant sale continues. It will be operating again this Saturday, Aug. 26, at our garden at 111 Trent St. W. Whitby ON. 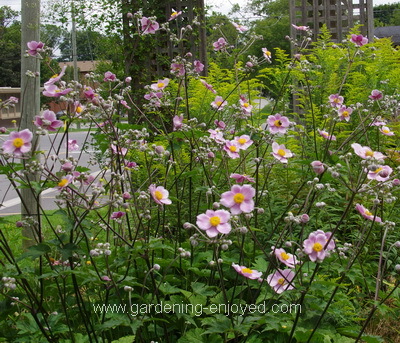 These Japanese Anemones or Windflowers should be in pots and ready for sale. There is still a good selection of Iris and Daylilies as I continue to dig up more clumps every day. I do like these Anemones at this time of year but they do want to slowly take over the garden so they need to be given a spot where they can be controlled or else have enough space to stretch their legs. My clump will be greatly reduced probably to make room for some of the Iris that I just cannot part with. All of this is happening in the front garden beds which are being revitalized and updated and, just possibly, made a bit larger. How much time, effort and money do I put into mulching these beds when I have finished replanting them. See paragraph #1. One of them has a very pernicious weed that I know as perennial Sow Thistle. Sonchus arvensis has a deep spreading underground root system that make it very difficult to remove by pulling. Some very deep digging will get most of it but that one small bit of root that you missed will eventually sprout. No amount of mulch will keep it down and non-chemical control is almost impossible. That is one of the reasons that these beds are being so extensively reworked. Weeds *%&*^$#&*^!!! Linda Asks? I was wondering is there any such thing as putting too much compost around your plants? Thanks, Keep those news letters coming. Ken Answers! Moderation in all things, (except possibly plant acquisitions) is my life’s motto and it applies here as well. A couple of inches of compost should be more than enough to improve the soil and supply nutrients. I have no idea what might be too much compost but it would probably be the physical presence covering the roots and stem that might be a problem. Dan Asks? My tomato plants have developed what appears to be a fungus. The leaves are turning brown covering the complete plant and then falling off. The fungus is moving from one plant to another. It is not attacking the tomatoes. I obviously don't want to treat the plants not knowing what it is or applying anything that will be harmful to ingest. Ken Answers! It's that time of year when early blight arrives on Tomatoes. Mine looked fine when I left last week and now the bottom leaves are turning yellow and then crispy brown. I remove the infected ones as soon as possible and spray with Bordo, a sulfur based product that is acceptable to organic growers.